It's easy to be a bit manic as an artist. There are so many interesting parts of art it's hard to know which to focus on. And it's easy to be seduced by one then the other so that you seem to move about erratically with no clear sense of direction. In some ways it may be similar to a cook who has a mental encyclopedia of all the various enjoyable tastes and combinations of tastes that are available to him. But you can't use them all at once! My guess is that the secret of any successful artistic/creative endeavor is to learn to focus on one thing and sublimate others. 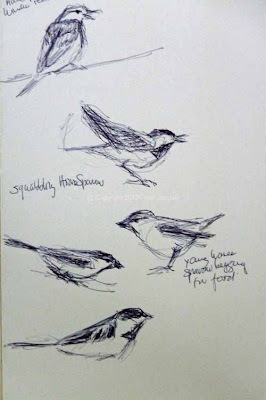 I had to think of this when sketching the House Sparrows that are at a window feeder outside my studio. They were particularly raucous today with at least 15 of them fighting for the space for three that the feeder allows. Some sketches of them are at top. Seeing sketches that capture a sense of liveliness and animation reminds me of how much I love this in art. At times I can value it over everything else. I've never studied animation or cartoons but this type of sketch veers toward a cartoon. This could sound bad, something lower on the cultural hierarchy than more ambituous, finished art. But I doubt it's true. There probably is a reason that both cartoons and animation are so popular. They strike a fundamental human chord. Among the other attributes of art I love are an orchestration of order, of color, tone, composition. This is almost the opposite of the spontaneity of field sketches. Soon I'm sure that desire for orchestrated order will come to the forefront again. But for now I'm happy to be trying to capture the sense of animation of the birds I see. Above is a Ruby-throated Hummingbird that has been frequenting our monarda. Below him two versions of a singing Common Yellowthroat. At bottom a House Finch also from the studio feeder. Outside our kitchen a small and young Downy Woodpecker has been frequenting our various feeders. That is him above along with a Great Blue Heron at the Wissahickon striking a particularly elegant pose. Real-life poses that are caught on paper rank high in my pantheon of desirable artistic qualities. Also a far-off Red-tailed Hawk. And finally the ubiquitous squawker of the summer, a Gray Catbird. They're so easy to ignore, especially as they mimic the sounds of other birds and can make a birder think the bird is far more unusual than it really is. But they're also very animated birds. I've tried to capture some of that here. To me this is far more exciting than putting down every little feather of the greater coverts and having it look dead as a doornail. 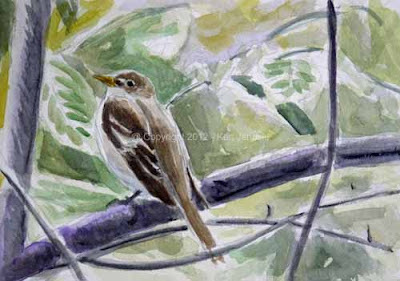 With him is a back view of an Acadian Flycatcher. This is another ubiquitous bird of the Wissahickon and one I'd really like to master before the year is out. Bracketed by strong rain on Friday and today the Manayunk Arts Festival took place this weekend. At least for me and I think the Manayunk Roxborough Art Center it was very successful. The festival itself also was a bracket. At top you see the catalog for the very first art show I believe I was ever in, in 1975. At that time I don't think I'd had any art education at all outside of a ceramics course that was so bad it didn't have potters wheels. Raw enthusiasm convinced me I was good enough to get into the juried show. And I did. So I was thrilled to come by the next day and watch people admire my work. HA! I learned early on that at least 50% of the audience at a festival does not even glance in the direction of your work. They walk right by without their eyes even going in that direction. A good customer is one that actually stops long enough to focus on what you've done. They may move on in a second or two but at least they've looked. I may have been in one or two more of these festivals in San Francisco but I haven't shown again for more than 30 years, at least in festivals. 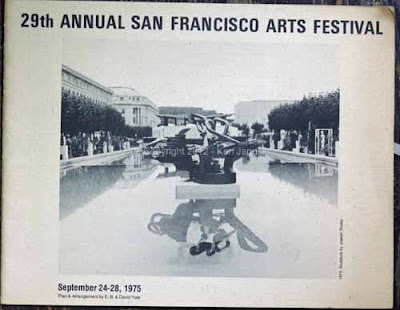 Once I started taking courses in art, at City College of San Francisco, University of California at Berkeley, and Cornell University I was only interested in showing in galleries, and only the 'serious' ones, and museums. I have showed in numerous galleries and museums. I continued to try to show in the 'serious' galleries for 20-25 years. But as I did so I also realized that I found that scene very stale, inbred, predictable and a little full of mullarkey, to put it nicely. I've been uninvolved in the gallery world for at least 10 and maybe even 20 years. If someone had been showing and selling my work it would probably be different. But I'm not sure that would be the case. And of course it's hard to judge the influence of sour grapes. When I studied art history I ran across an original essay from the 1700 or 1800s. In it the little-known author said how much he admired 'ignorarts', people who hadn't been educated in the arts but still had an opinion on art. He found their perspectives refreshing. This has alway struck me as both true. Many people will see your work through the prism of what they've read or been told. I prefer to get their own personal reaction. About the time I gave up on the current art scene I noticed that all the galleries were showing 'important' art. Yep, that's what they called it. Who made the determination if the work was 'important?' Well they did of course. But it seems to have worked, at least as a marketing ploy. Millions and millions of dollars change hands in the art world each year. So much 'important art' moving about. I was always tempted to label a new show 'Unimportant Art' to show how silly the concept had become, with everyone thinking that their own art was important. I can hardly read about contemporary art without getting angry. It seems so full of marketing and nothing else. This is a very long-winded way of getting to why I enjoyed the art festival. I got to talk to numerous people about my art. I got to judge their reactions based on what they actually saw, not based on wha they'd read or what was written on the museum wall or what some gallery dealer was whispering in their ear. My guess is that the proportion of viewers who scooted by without even glancing my way is about the same as it was in San Francisco in 1975. But now it doesn't bother me. I realize that the audience for authentic art is small and within it a much smaller group might be interested in art in my own style, subject and media. But this is fine. I think that the secret to art is to believe that you have an audience and it just has to find you. Not everyone will be able to afford it even if they liked it. I talked to numerous people who I know liked some of my work though they didn't buy any. Still they now know my work and may purchase it later online. Or they may stop by a Manayunk Roxborugh Art Center show. More than that I've gotten some honest feedback on my work. In all my many years of making art I firmly believe that what artists most value is honest feedback. It's not always pleasant and it's not always right. But it's always nice to feel that you're talking to someone who has actually taken the time to look at and appreciate something you've spent so much time and effort on. I'm not sure you get that even in the most prestigious galleries, showing the most 'important' art. It is truly astonishing I think to compare the time and effort that goes into making authentic art, and by that I mean art that is not created by some easy formula, and the time that most viewers will spend on it. 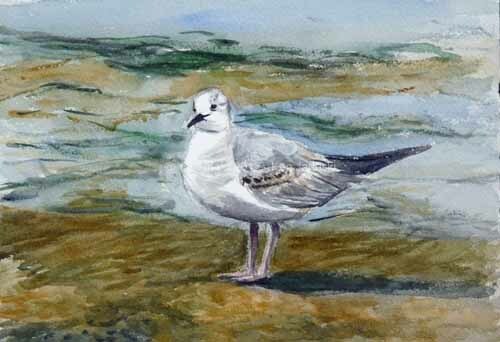 A painting can easily take 20 hours or more but the average viewer spends less than 5 seconds looking. The mitigating factor I think is that if someone buys it who likes it they'll see it and enjoy it almost every day. So eventually there's more time spent looking at it than was spent on creating it. 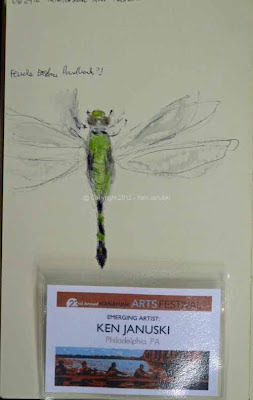 The second photo at top is a small field sketch of a dragonfly that landed on the frame of another MRAC artist. Since he just sat there for 30-60 seconds it was a great opportunity to sketch him, or actually her. This morning I got out my new field guide and realized it is most likely a female Eastern Pondhawk. And what about the peregrine of the title? I've known that peregrines have been nesting just around the corner from where the 'Emerging Artists' booth was for months. But I've rarely had time to check on their progress. At the end of a 12 hour day on Saturday I turned the corner from the festival and began the long uphill climb home. As soon as I did I heard raucous calls from above. There above me were three peregrines, one adult and two young begging for food. I soon ran into a friend of mine who said that there were actually four, two adults and two young. It was thrilling to see and I hope to get back soon to see and sketch them. And finally the second most popular statement of the audience in the 'Emerging Artists' tent: 'You guys have emerged! You're not emerging!'. I think that's true. I hope that reflects well on both the Manayunk Arts Festival and the Manayunk Roxborough Art Center. It would be nice if both developed reputations as places to see quality art. I have to think, without being too self-congratulatory, that we did our part this weekend. The most popular statement was "How did you guys get this big shaded tent?" I think our spot was probably the coolest on a very hot day. Oh yes, that Bonaparte's Gull watercolor that I've shown recently here, is now in someone else's home. I'll miss it but I know that someone else will now enjoy it. I really liked it but I'm happy to know it has a good new home. I trust that more time will be spent looking at it and enjoying it than I originally put into it. We're at the start of an Excessive Heat Warning here. It goes through the next 40+ hours and won't be exactly cool when it ends. This seems appropriate since the Manayunk Arts Festival starts this weekend. I don't plan things this way but as I think back about the various shows I've been in I often picture myself sweating like crazy, working in incredibly hot weather, trying to ready a show. Fortunately I'm a bit more prepared for this show and had some advance warning about the heat. So I have most of my work ready to go. Above you see some of the framed work, including two gull watercolors from 2012. That Great Black-backed Gull at Flatrock Dam looks refreshingly cool doesn't he. If I were a marketer I might hope that it might be a subliminal message to viewers this weekend to buy it and instantly feel cooler. 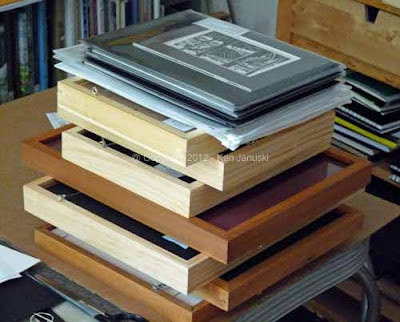 Above you see a stack of seven framed watercolors and linocuts. On top of them are about 15 linocuts, that are in mats but not framed. They'll all go the the Manayunk Roxborough Art Center. 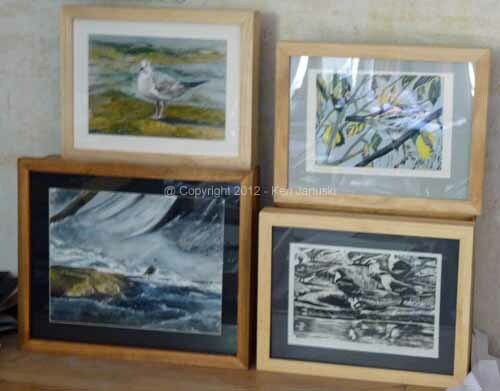 Eventually some/most/all of them will be transported along with other work from members, especially five exhibiting artists, of the MRAC coop to the arts festival. There they will be part of the Emerging Artists Showcase at Main and Roxborough. The festival itself of course wants to showcase the Manayunk area, though artists and crafters from across the US will exhibit. The Emerging Artists Showcase features local artists. Since I live less than a mile from where I'll be exhibiting I guess I qualify as local. You can't get too much more local than that. But it also will showcase the Mayanunk Roxborough Art Center mentioned above. Like many places, especially non-profits, the economic downturn has hurt in may ways: fewer grants, fewer purchases of art, part of whose profits go to the center, etc. MRAC was once a thriving part of Manayunk and Roxborough. The exposure gained at the arts festival will hopefully help to return it to that thriving state Along with art shows it offers many classes as well as literary programs. See the site for more info, or stop by the festival this weekend. A few months back I posted a couple of pictures of the largest gull in the world, the Great Black-backed Gull. It is a truly imposing bird, though even it doesn't look quite so big compared to the Wandering Albatross I saw at the Academy of Natural Sciences a week ago. The gull above is one of the smaller gulls, the handsome Bonaparte's Gull. This is based on some photos and sketches from the Cape May, NJ area in early May. I have been doing a number of watercolors recently with the thought of showing them at the Manayunk Art Festival this weekend as part of the Manayunk Roxborough Art Center in the Emerging Artist tent. I actually emerged quite awhile ago but only recently as a naturalistic artist. So 'emerging' still seems somewhat apt. I'm not really sure now what works I'll put in show. There will definitely be many matted prints but I'm not sure about framed works. 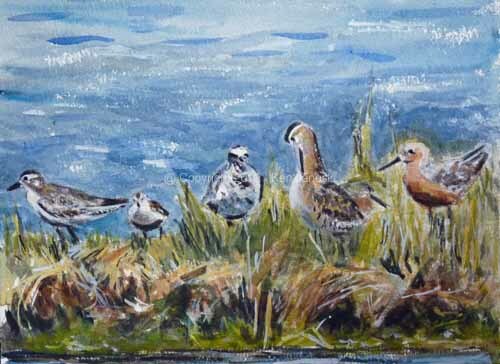 I've also tweaked the other recent watercolors I've shown here previously, the Killdeer with Worm and the Short-billed Dowitchers at Nummy Island. Above are the finished versions. As I said I'm still not sure what works I'll be showing. You may need to stop by to find out. Hopefully the near 100 degree weather that is supposed to arrive on Wednesday will be long gone by this weekend. I seem to recall that when looking at some catalogs for various things I will sometimes find them described as 'multi-sourced', meaning that they are put together, or use materials, from various countries. 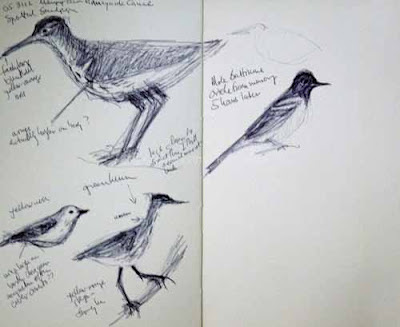 After looking at a number of specimens of extinct birds yesterday and sketching them, then going into an auditorium a few yards away and sketching live birds as they flew about, I realized that I was using two of the main methods of drawing birds, or much of nature: live and from dead specimens. The third method, available only since the mid-19th century, is of course photography. It is the last source for naturalistic artists, excluding pure imagination. The watercolor above is based on this method. Over the last few days I've worked quite a bit on the underlying sketch, based primarily on one photo I took on Nummy Island this spring. After I got a few watercolor washes down today I erased much of the labored pencil drawing that was underneath. I'm going to try to keep much of the untouched paper in this one and limit myself to light washes. We'll see. This year is the 200th anniversary of The Academy of Natural Sciences in Philadelphia. 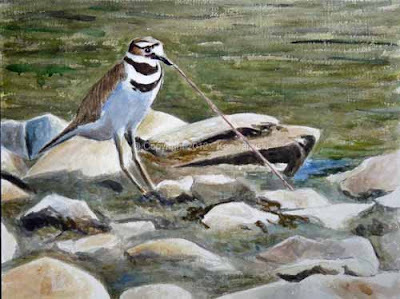 June celebrates birds there and this weekend hosted 'Birdfest.' I knew beforehand that certain specimens would be out for viewing. Still it was shocking to stand in front of one exhibit that held a Passenger Pigeon, Carolina Parakeet, Labrador Duck and Heath Hen. These birds were all stuffed, i.e. preserved through taxidermy. Nearby was a huge Wandering Albatross. I've never worked from specimens before and I didn't really do too well here, being self-conscious as I drew and people walked about to look at the exhibits. But it was just too much of an opportunity to pass up. 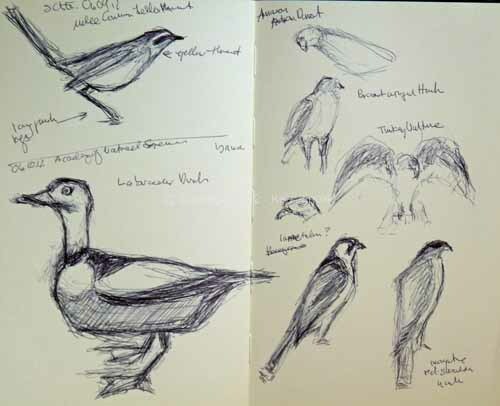 The Labrador Duck in the two pages of sketches above is the one bird I attempted to portray. Though 'Birdfest' only lasted for the weekend I'm hoping that I might be able to see other specimens next time I'm there. Other specimens, sadly, were all victims of window strikes found within two blocks of The Academy in central Philadelphia. To see rows of dead warblers, thrushes, woodcock, et al. is a very sad sight indeed. The one good thing about this is that much research is being done as to what might help prevent this including glass that includes patterns visible to the ultraviolet sensitive eyes of birds but not to humans. In a separate auditorium at the Academy a special show allowed numerous birds to fly free, some perching on the heads of spectators. Included were Amazonian Parrots, Lanner Falcons, pictured at bottom left of right hand sheet above, Red-shouldered Hawk, at bottom right, and numerous other birds. It was somewhat shocking to have a Macaw that seemed to be at least 2 feet in length fly within inches of my head. As you can imagine this show was particularly popular with the younger members of the audience but I doubt that anyone there couldn't remark on the wonder of it. I'd guess that many a life-long bird and nature lover got his or her start in just such a setting. 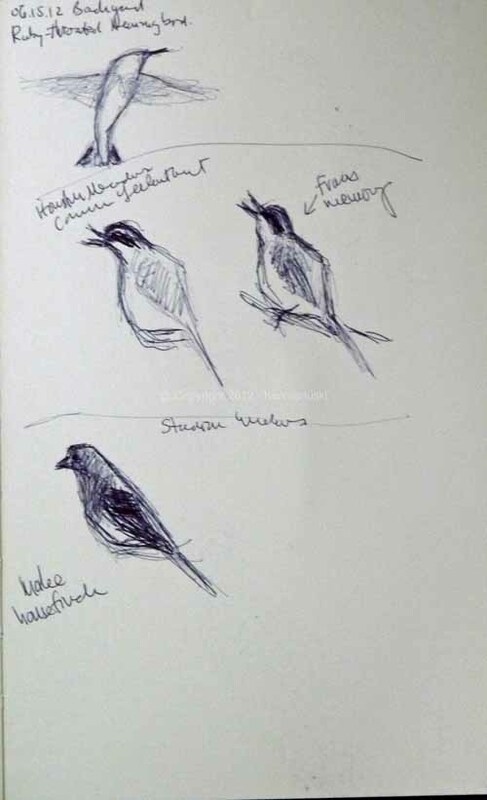 The other source for bird sketches of course is birds in your own outdoor environment. The top left of previous drawings includes a local Common Yellowthroat. 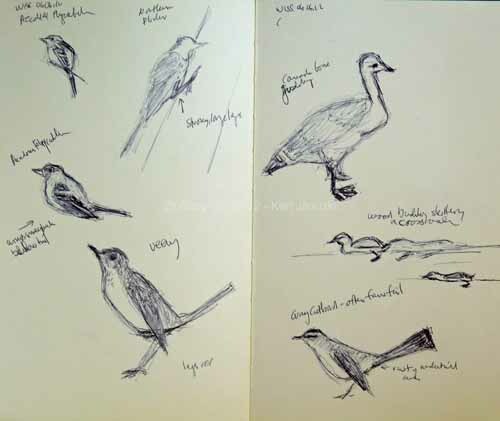 The pages above include a Veery, a lone Wood Duckling skittering across the water to catch up with his fast departing family, more Acadian Flycatchers and a few other local birds. Given the subject and the fact that this may not be quite done yet I couldn't resist the title, 'Worm in Progress.' I'm doing a number of new works, at least those are my plans, for the Manayunk Arts Festival in two weeks. I'll be in it with my local coop, Roxborough Manayunk Arts Center as part of the 'Emerging Artists' section. See the photo at bottom of link for some idea of the Manayunk neighborhood and the show. I've debated doing a painting based on this photo for years. The upcoming show convinced me to finally give it a try. This is a bit larger than usual for me, 12x16 inches on Arches 140# paper. For some people it may seem illogical to think that abstraction in art can only happen after the artist understands realism. Perhaps it's better to say that you can only simplify after you know the complexity of a subject well enough to simplify it, leaving out inessential parts. Until you're really familiar with the subject it's hard to say what's essential and what's not. Some abstract/modern/non-objective art of course never understands the subject and isn't really interested in doing so. I'm not going to judge whether this is good, bad or neither. But for myself I've found that I do like to understand a subject before I simplify it. So often I'll use photos as a basis for a painting if I think it will help me learn the birds better. I'm not sure that this works all that well. But I think that there is a mental process of trying to understand the structure of a bird that you see in a photo that can help in understanding. That's particularly true in the second watercolor which I'll show below. But it's also true in the watercolor at top, 9x12 inches on Arches 300# cold press paper. 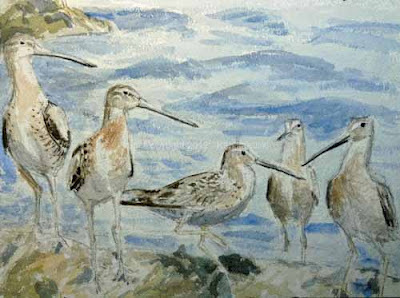 This is based on the type of scene that I love, a variety of shorebirds. We rarely see the endangered Red Knot but we saw a number at Cape May this year, mainly on Nummy Island near Stone Harbor. He is at right along with a Short-billed Dowitcher, a Dunlin, and two Black-bellied Plovers in a variety of plumages. I hope that as I paint more shorebirds I'll get comfortable enough with them so that I feel free to simplify and abstract when the notion takes me. I think that the breeding bird I see most often in summer, if I discount our yardbirds of House Finch, House Sparrow and Robin, as well as the ubiquitous Gray Catbird, is the Acadian Flycatcher. 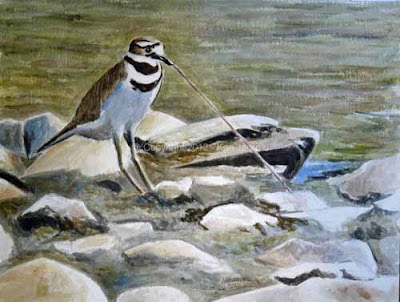 It's not really a common bird, but it is common in some areas that I bird, particularly Wissahickon Creek. I've done many, many field sketches of it. Today I saw 4-5 and did more field sketches. And yet I feel that I still don't have it down. What is the shape of the head? What is the angle of the bill when seen from below as is so often the case? In an attempt to understand the structure a bit better I did the small 5x7 inch watercolor above. It looks very familiar and I think that's because it's one of the best Acadian Flycatcher photos I've taken so I've used it often. In any case that is the goal of the watercolor above. The new photos I took today of a bird perched just 6 feet away will also be used more than once I'd guess. But soon I think I'll be able to get an accurate field sketch and will no longer need photos. I think some birders would get bored with the Wissahickon in spring and summer. Just the same old birds. That may be. But until I've mastered sketching them they're always a great opportunity in my eyes. There is always something new to see. With the weather back down to the 70s from the mid-80s it's the perfect time to be outside. So I and my wife couldn't resist checking out some of our local birding spots, most within a mile of our home. The proximity and variety of good birding areas is always somewhat shocking to me given that we live in Philadelphia, one of the largest cities in the U.S. In any case yesterday we walked along the Manayunk Canal, just down the hill from where we live. 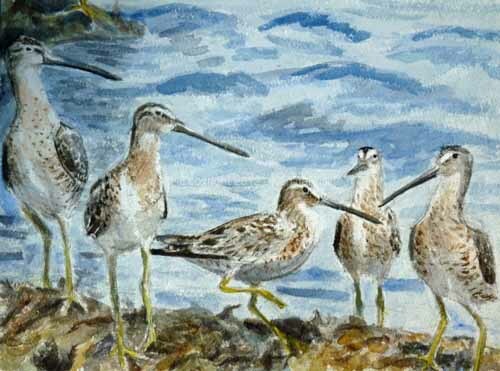 The biggest surprise were two Spotted Sandpipers, one of which is at top of sketch above. Though Green Herons are common here I think the one pictured above is the first we've seen in Philadelphia this year. Yellow Warblers as well as Baltimore Orioles are both common at the canal. But the striking yellow of one, and orange and black of the other are always a great pleasure to see, exhibiting the celebratory colors of summer. As you can imagine, and as I've written over the years, I always want to portray some of that beauty and my reaction to it. I used to feel I needed the camera to capture this, and then I could get some faint semblance in art based on the photo. 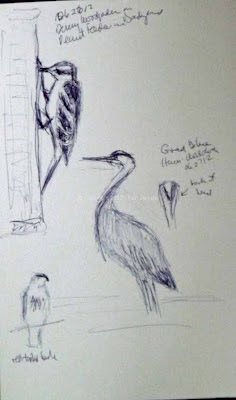 But now I'm much more likely to draw what I see even when the bird is long gone. That's what I've done above. I'm getting much more to trust myself, so will spend a short time looking at bird, then try to sketch it, often not looking up for a minute or two. If the bird is still there then great, I can confirm what I've put down and try to refine it. But if not at least I've gotten something. At home I'll compare it to photos I have. The most surprising thing about these sketches is that I didn't do the Baltimore Oriole until I got home. 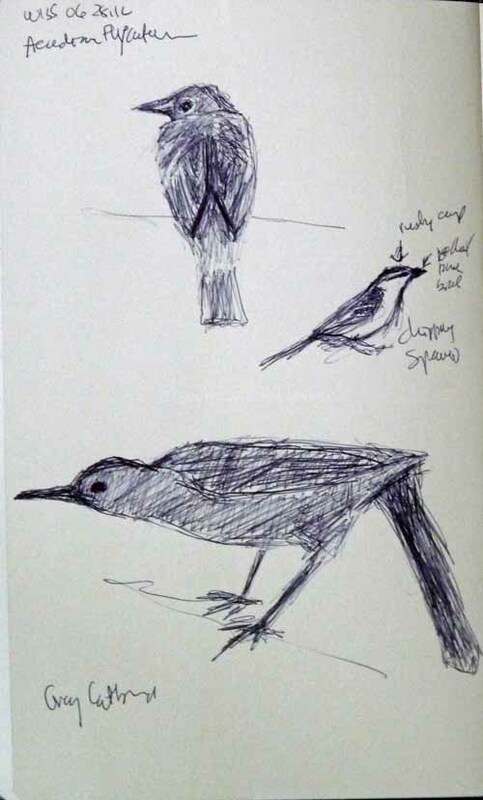 The page looked empty, I'd wanted to sketch one of the orioles we'd seen but didn't have time, even though I had noted certain aspects of it that I often seem to get wrong in drawing it. In any case I added this sketch about 5 hours after seeing the bird. I'm sure that this can be overdone, relying too much on generalizations and not enough on actual looking. But I've always had the opposite problem, looking too much and only getting an unrecognizable line or two down. On top of that I never had a general impression of the bird which could help me flesh out the sketch. So I'm happy with my growing ability to generalize. My guess is that all talented field sketchers use a combination of both methods. I've shown the left hand side of the pages above previously. But I liked all the bird activity shown when I included the left side so I've shown the full two page spread. On left a male Hairy Woodpecker feeding a grub to a youngster. On the right a Yellow-throated Vireo at top. This is a bird we rarely seen and one I hope will remain here to breed. It just calls out to be painted with its yellow throat and spectacles, and white belly but I'm not going to touch the sketch. Perhaps I'll do another based on this that I can then add color to. Below the vireo is the star of the show, a Northern Mockingbird seen at Houston Meadows. He exhibited behavior I've never seen before, jumping forward on the ground and flashing open his wings. It was fascinating to see and I assume was meant to scare up prey. When we got home I found a number of photos of such behavior in my various guides. One showed something I'd missed here: a real lunge forward with one leg much in front of the other and the torso more horizontal than vertical. It makes me want to get back to the meadows and see if I can study this behavior more. It just calls out for a painting or print. Almost all of these birds are local breeders, the only possible exception being the Yellow-throated Vireo and Spotted Sandpipers. But as I said in a previous post June and breeding season can be a fascinating time. 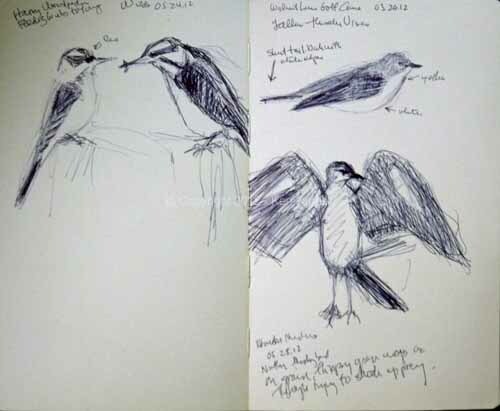 Most of the migrants have now gone through and only the summer residents remain. But they're a pleasure to see and to portray.